After getting off Freezeout Ridge the day before, we spent two hours on the road to west end of Pasayten Wilderness and car camped near Canyon Creek Trailhead. In the morning we pulled into the parking lot with over a dozen cars already parked. 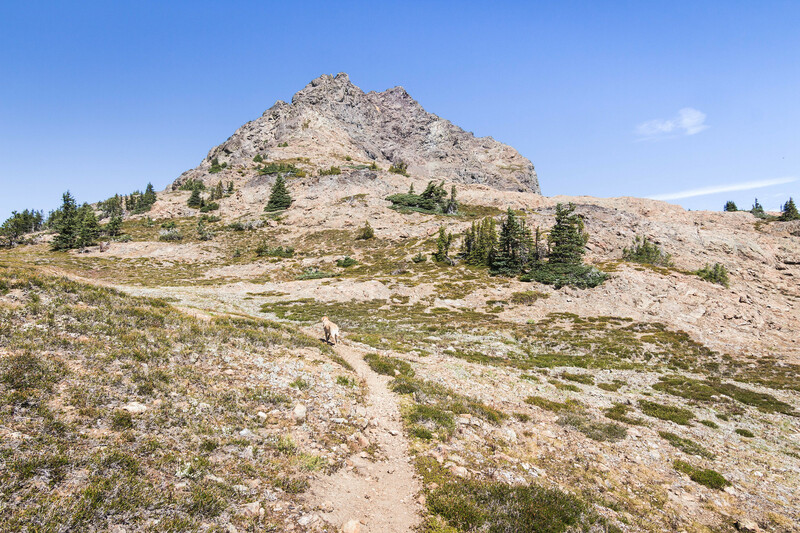 Jackita Ridge Trail (#738) was just how I remembered it from two years ago–mercilessly steep! 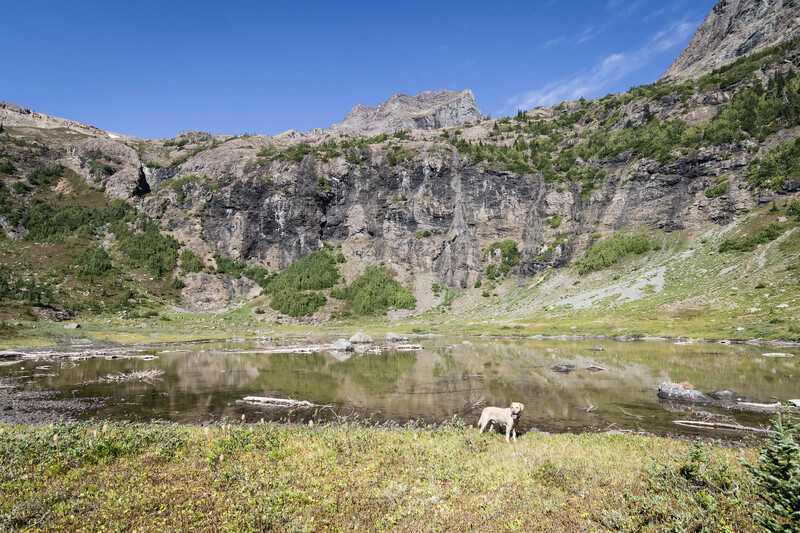 After crossing bridges over Granite and Canyon Creeks followed by a couple of long switchbacks, the trail immediately shot straight up south slopes. Eventually the trail tapered off at 5,000′ before we made a left onto the Crater Lake Trail at the junction. One mile on the somewhat brushy trail and we were at Crater Lake. Not a whole lot left of the lake after a long, arid summer season. Following the hikers trail due west, we quickly attained southeast ridge as the trail meandered in and out of the wilderness boundary. Terrain steepened for 400′ before gradually tapering off at 6,800′ and changing direction due north. Only false summit was visible from below; true summit sat farther north. We continued to follow the hikers path and eventually got around to west of the ridge crest. Trail worked its way under several cliff bands before entering a narrow, steep gully at 7,600′ with lots of choss. It’s entirely possible to get off route and/or cliffed out through this section if cairns weren’t present. The reported yellow markings guided us through steep ramps and ledges. Crux for the pup was the one big step by the big yellow “x” right before attaining the south ridge. A defined, albeit chossy, hikers trail appeared on the ridge. We bypassed false summit from the west. With a long rising ascent followed by several short switchbacks and we were on the summit. 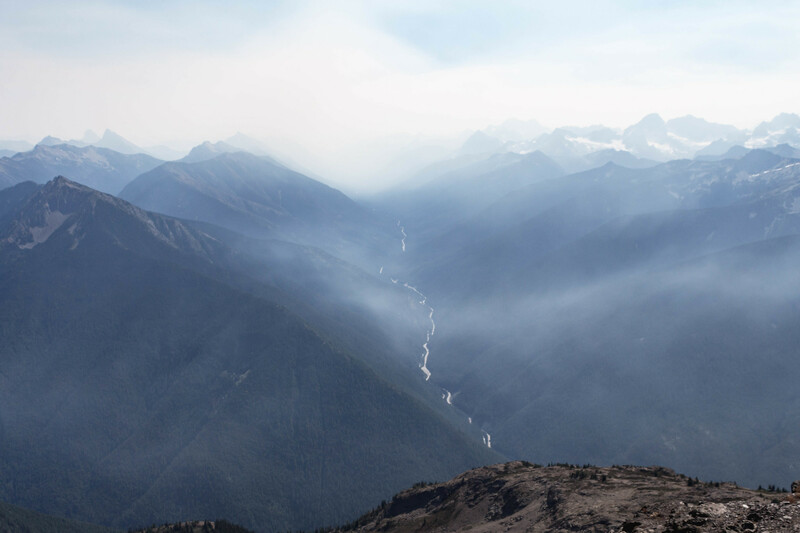 Wildfire smoke had slowly crept its way north and permeated into valleys below before we arrived at the top. Views to the south over Highway 20 would have been much more grand if it weren’t for the wildfire smoke. Although views to the north were great, including the intimidating sight of Jack Mountain. Seeing that the day was still young, we enjoyed a good hour on top before slowly making our way back down the mountain.